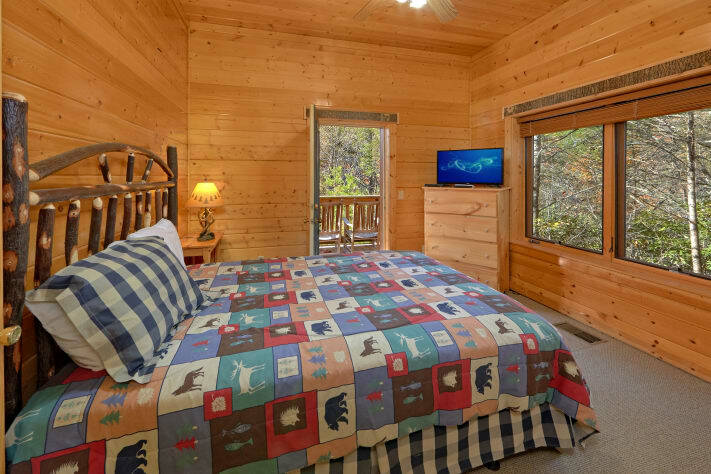 Buck & Bear Lodge - Mtn Views, Direct TV, Wifi, Gas Grill, Arcade, & Hot Tub ~ Perfect for families! 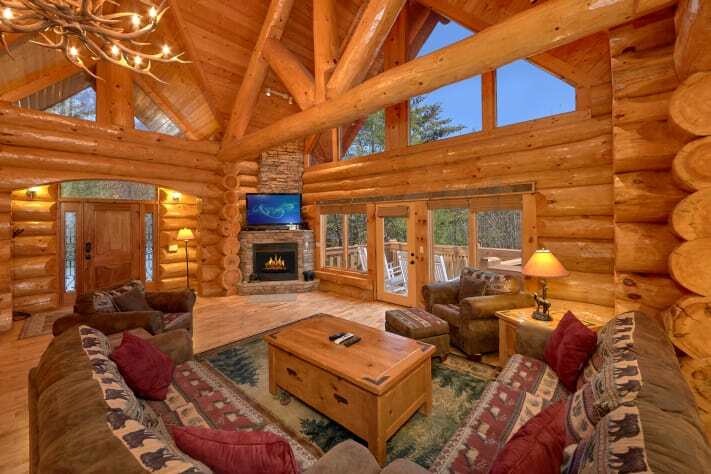 Welcome to Buck & Bear Lodge - bring your family to stay in our gorgeous 7 bedroom, 6 bathroom, beautifully furnished log cabin home with breathtaking mountain views. 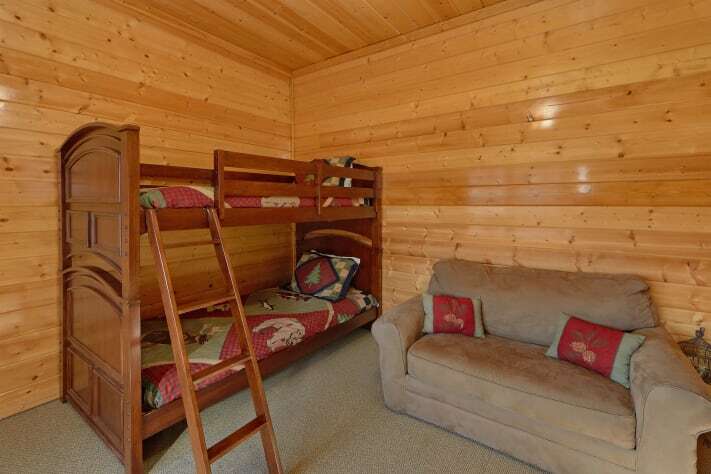 Our cabin is perfect for large family groups to all stay together in one place! 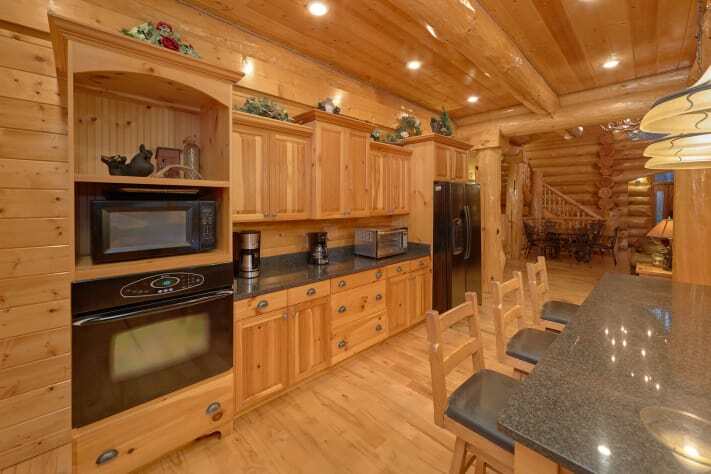 Our over-sized eat in kitchen with granite counter tops has all the amenities a chef may need, including plenty of seating for your family and friends. The eat in kitchen area seats up to 16 people. The spacious island counter provides seating for 3 people and an additional table seats up to 6. 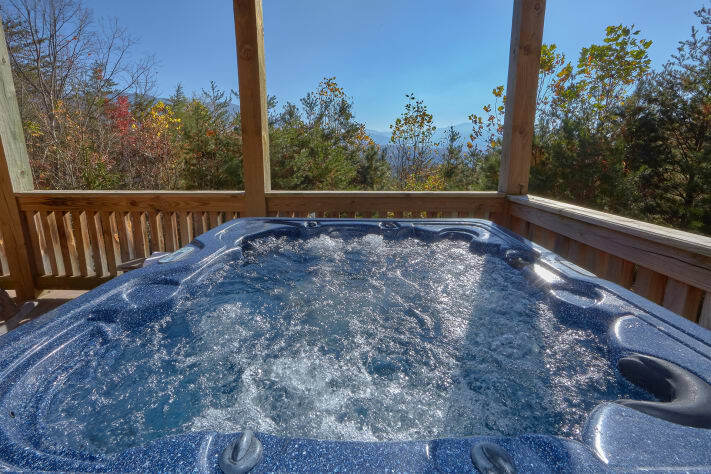 Take in the spectacular views of Mount LeConte and Greenbrier Pinnacle from one of the many decks or take a dip in the hot tub. 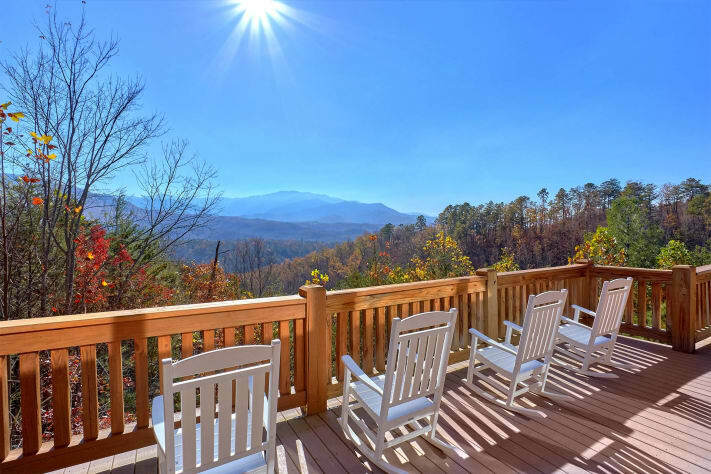 Outside on the deck is a gas BBQ grill and rocking chairs to sit and relax. 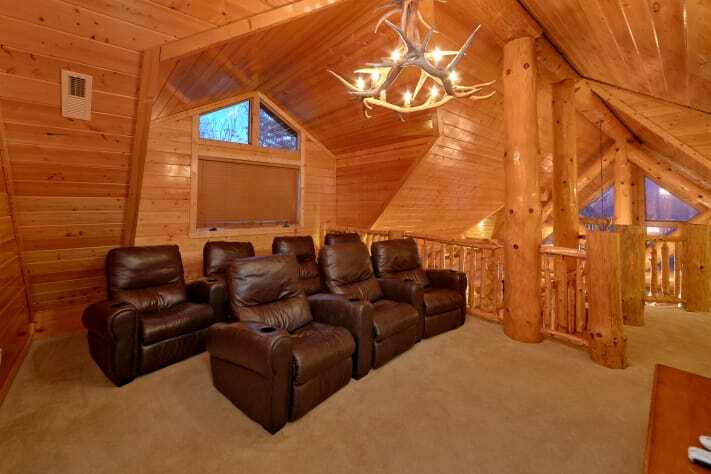 Upstairs in the loft, watch a movie on a 60" flat screen HDTV with theater seating for seven people. 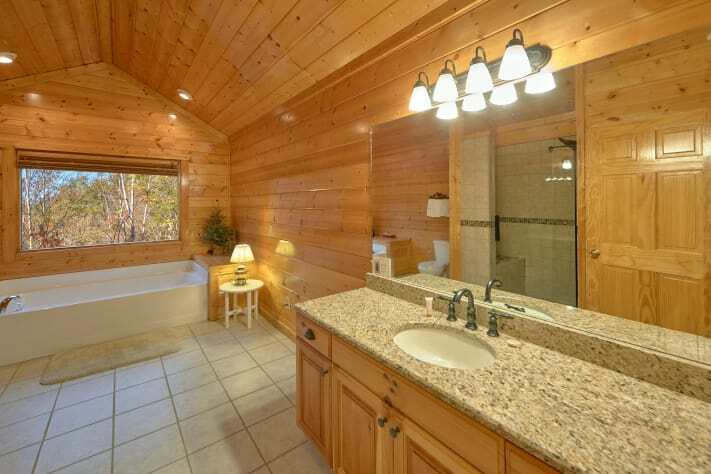 The upper level also boasts a spacious master suite with private deck and bathroom that includes granite counters, a separate shower and whirlpool tub. 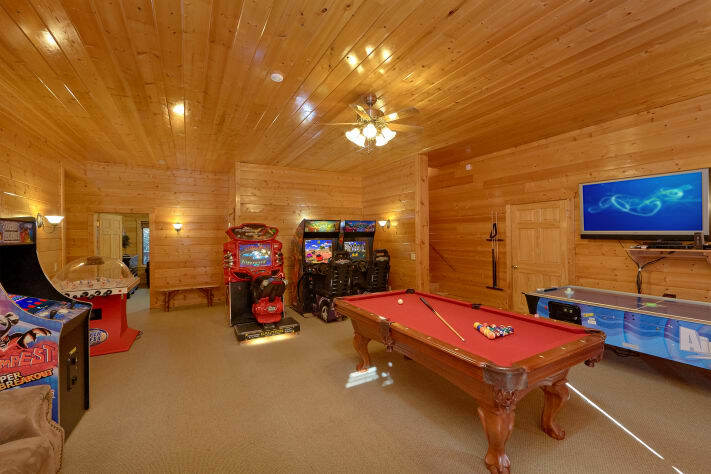 On the lower level is a fantastic game room offering fun for everyone with 5 arcade games, pool table, air hockey, and bubble hockey! The arcade games go well beyond the traditional Ms. Pacman. 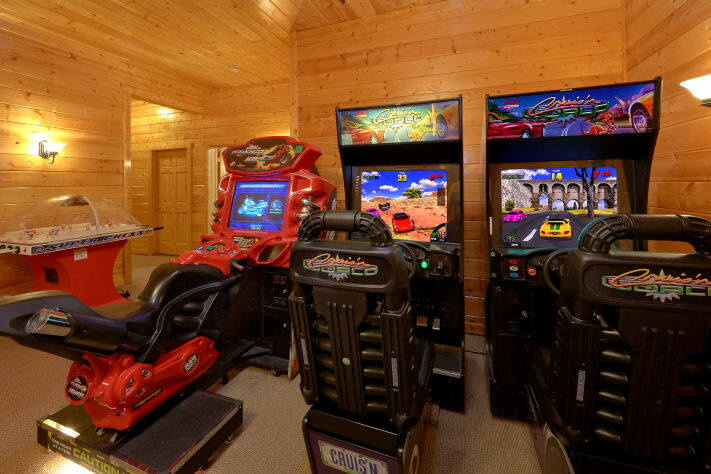 Buck & Bear Lodge has high-quality racing games that really make you feel like you’re on a snowmobile, motorcycle or high-speed race car. There is a second refrigerator available in the game room closet to provide extra food/beverage storage for larger groups. 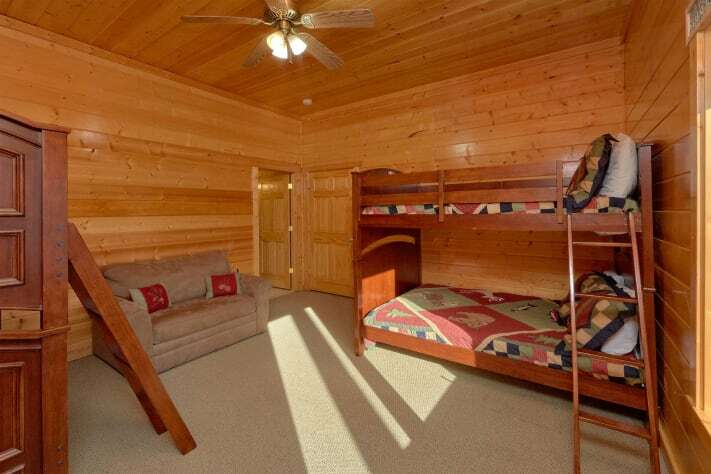 This level has 4 bedrooms: two bedrooms offer full sized beds and shared bathroom, one king bedroom with private bathroom, and a bunk room perfect for kids with attached full bath. 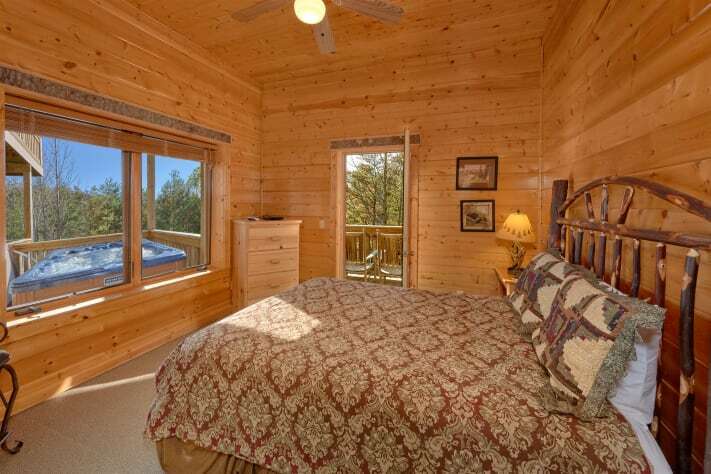 Private decks are available to all rooms, with the exception of the bunk room. 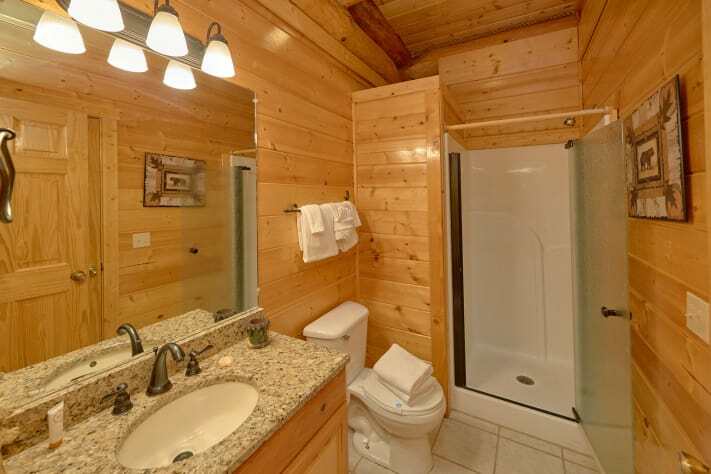 The lower level also has a queen size sleeper sofa and laundry room with washer and dryer. 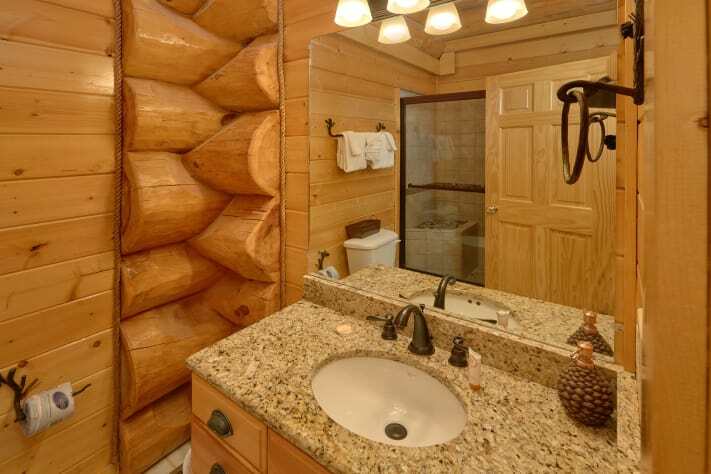 You will enjoy all the fantastic amenities this cabin has to offer - book your reservation today! 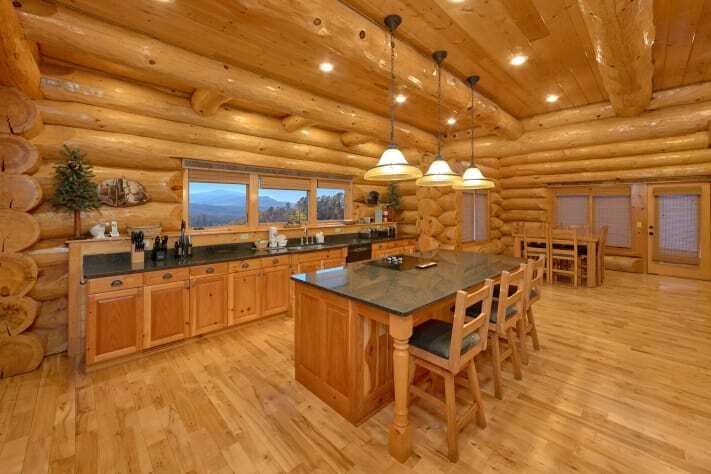 Why rent our cabin? Because when you rent with us, you are renting directly from an owner, not a rental company that is just trying to fill up rental properties. Customer service and attention to detail is important to us. 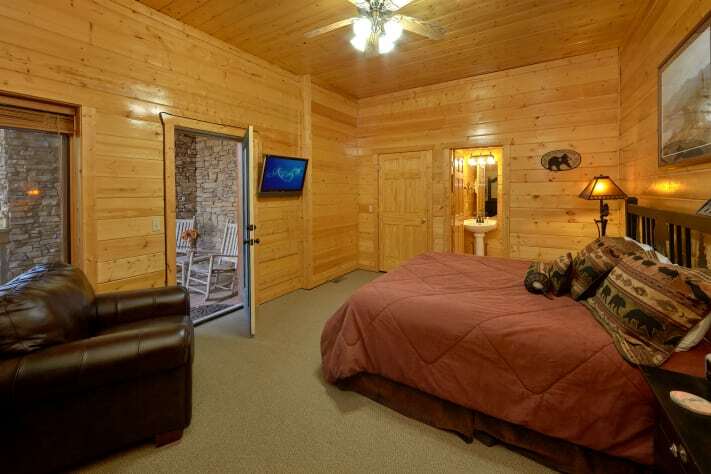 We'll do our best to make your stay in our vacation home an enjoyable one! The Game room has 1 queen sized sleeper sofa. 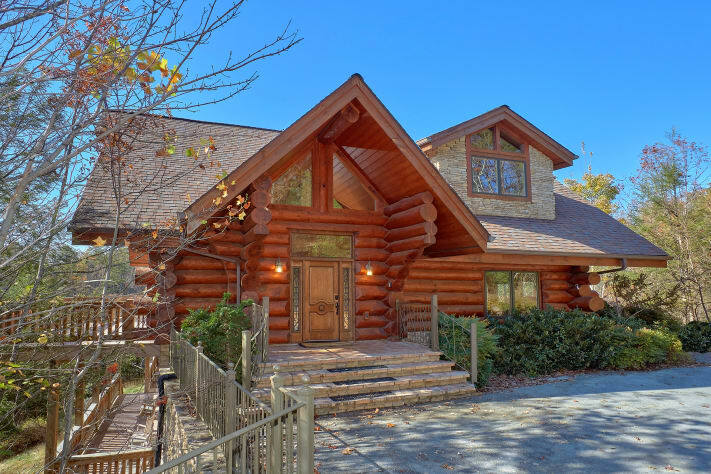 Buck & Bear Lodge is located on a mountain road. In the winter, guests may need four-wheel drive or tire chains during heavy snow and ice. 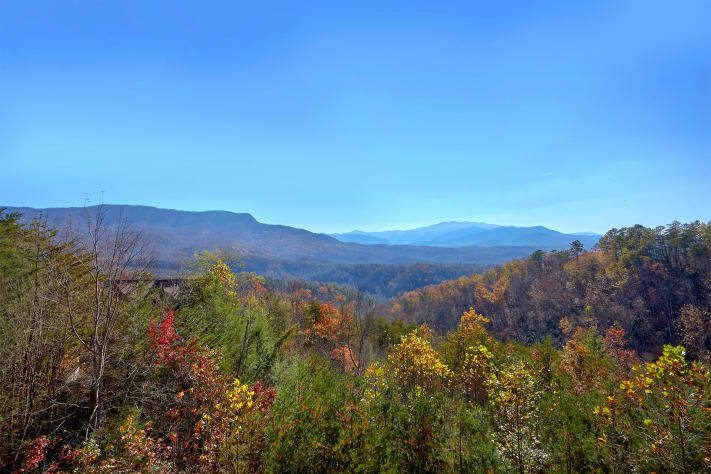 ~ The beautiful Greenbriar section of the Smoky Mountain National Park is approx 4 miles from the cabin. This is a lesser known park entrance features beautiful trails, plenty of parking, picnic area, playground, and access to the Pigeon River for fishing. From here it is a 4 mile hike to Ramsey Cascades which are the tallest in the Smokies or you can enjoy wildflower viewing on the Potters Creek trail. ~ Mills Park is approx 5 miles from the cabin. It has a 9 hole disc golf course, jogging trail, horseshoe pits, sports fields, playground, covered picnic tables and grills, and restrooms. ~ Gatlinburg Community Center is approx 7 miles from the cabin. The 52,000 square foot complex has an indoor swimming pool, basketball court, racquetball, ping pong, bowling alley, fitness center and showers. Visitors are welcome to take advantage of this beautiful complex for a small fee. ~ Bent Creek Golf Course, designed by three-time Masters and British Open Championship Winner Gary Player is just a 10 minute drive. 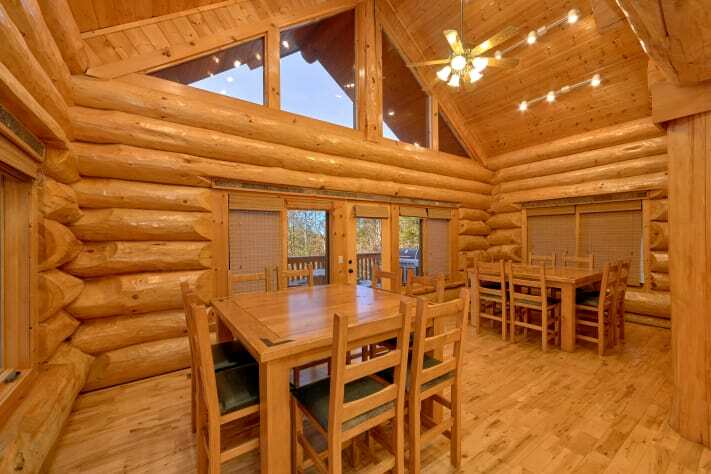 ~ Downtown Gatlinburg is just 20 minutes away. 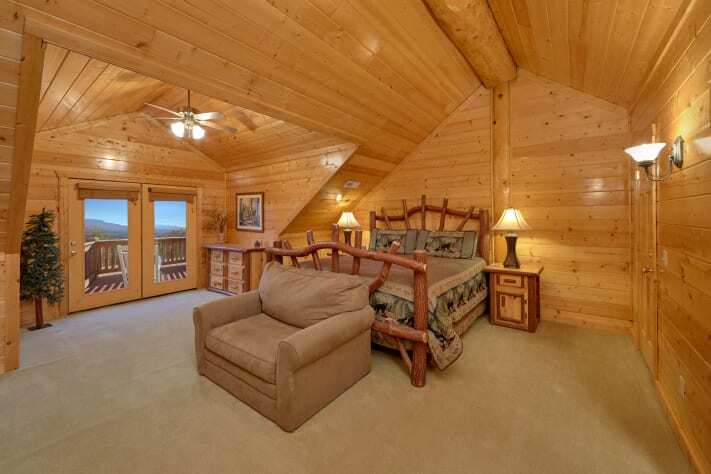 ~ Ober Gatlinburg Ski Area and Amusement Park is about 15 miles from the cabin. 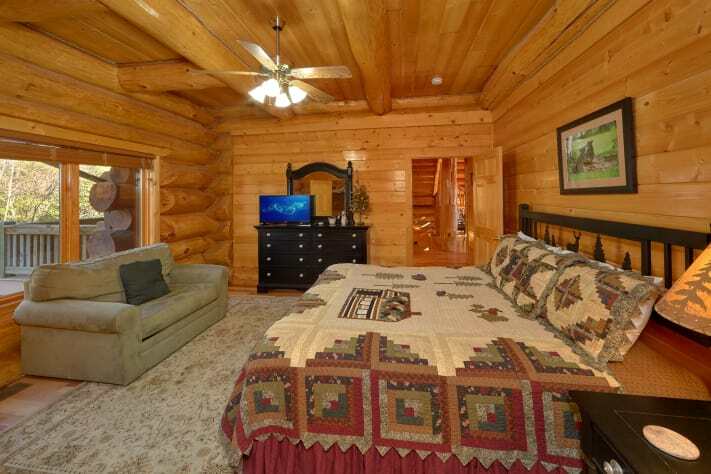 ~ Dollywood and outlet shopping in Pigeon Forge is about 20 miles from the cabin. Spent a full weekend at this cabin and was very pleased. Kitchen was fully stocked with pots and pans. Loved how many bedrooms were available. The view was outstanding with the mountains right behind us. Game room was fun to play in with games I had not seen in quite some time. Would recommend to anyone. 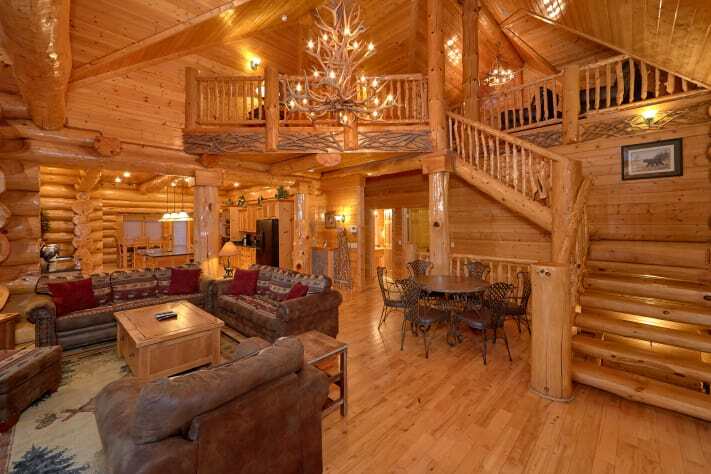 We had our family reunion at Buck and Bear with several families it was a very comfortable stay. The previous visitors had made a mess ( owner had given me a heads up about it) but by the time we got there everything was clean. The kids loved the arcade the older folks loved the kitchen and the outdoor views. I would totally recommend this place for anyone looking for to gave a big family reunion. 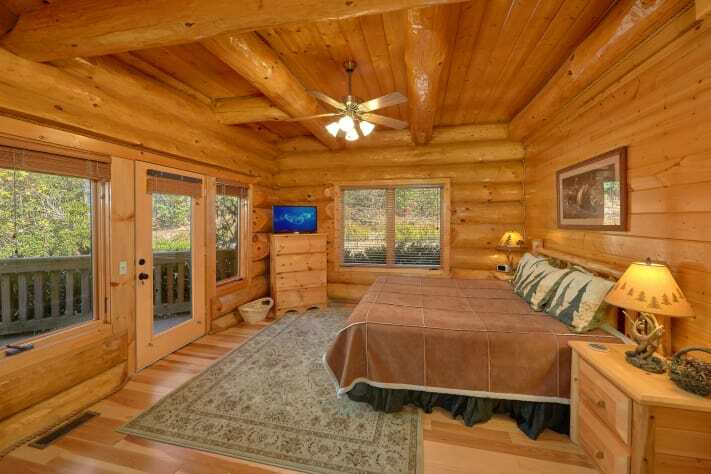 Very beautiful place with great views and close to everything you need!! 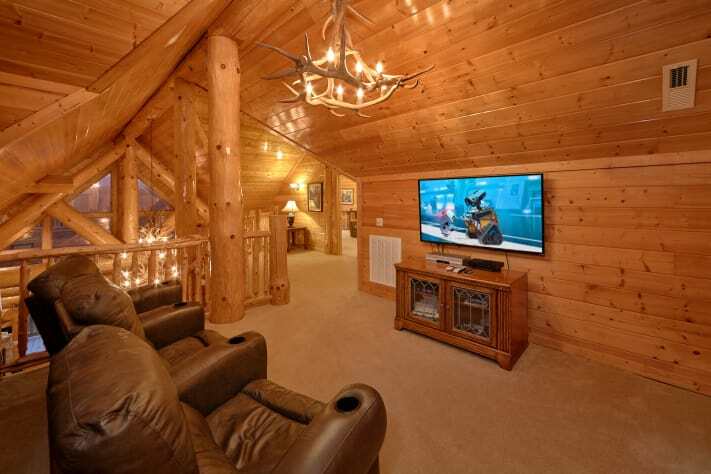 Great family time with this cabin having everything we needed and enough space so we didn’t feel like we were on top of each other. A game was not working when we got there and the owners got it fixed withing 24 hours. Overall great experience and we will be back! !